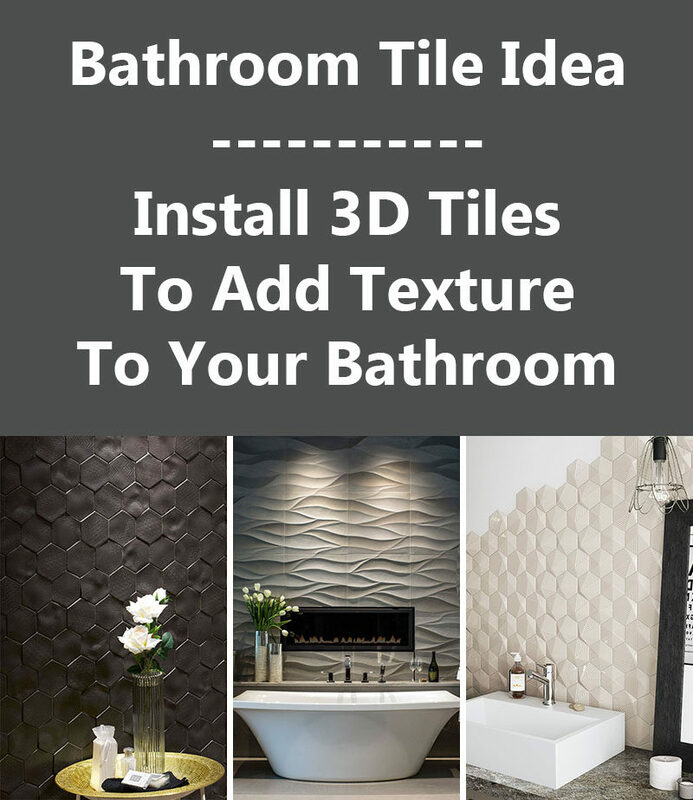 3D wall tiles are a great way to make a bathroom feel more luxurious, unique, and original. They come in all sorts of shapes, sizes, and styles, and can be arranged in endless combinations to create original patterns completely unique to your space. They’re also a great way to add texture to the space and are a creative alternative to the traditional 2 dimensional tiles typically found in bathrooms. 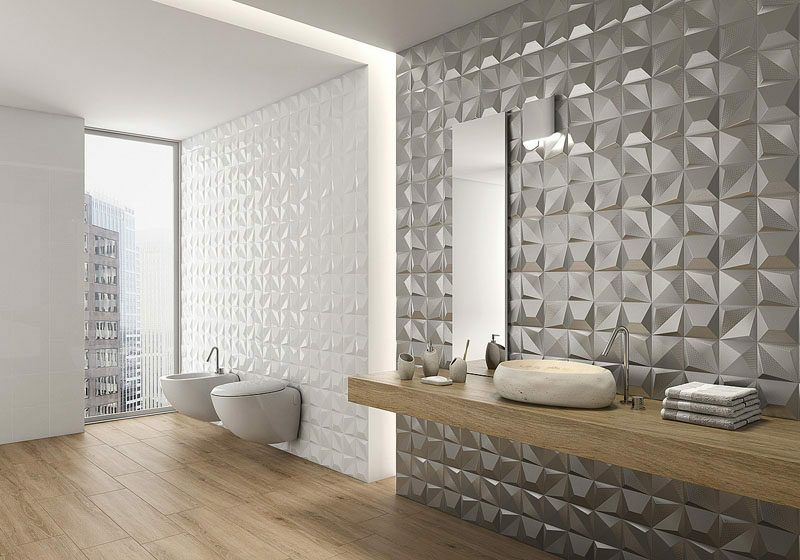 Here are 16 examples of 3D wall tiles used in bathrooms to give you some inspiration and maybe even a little bathroom tile envy. 1. 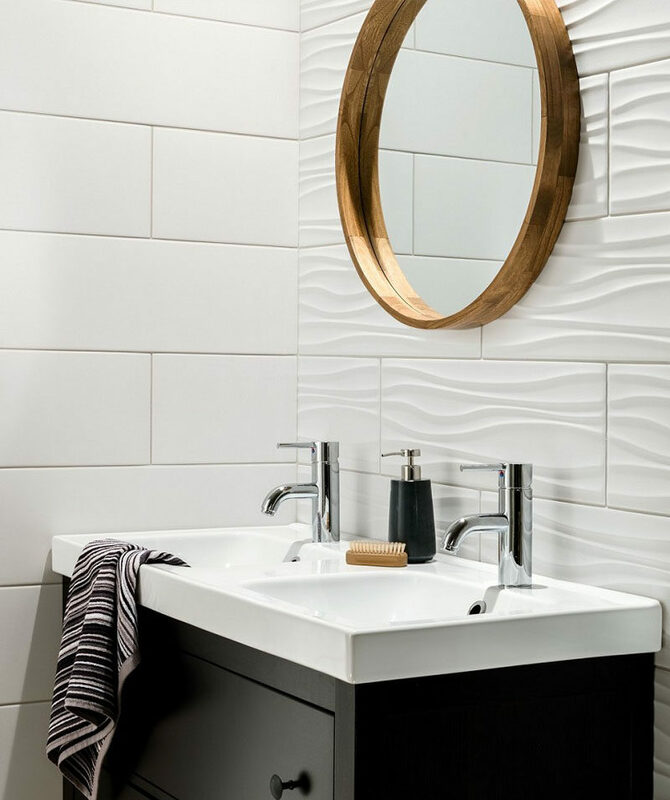 The ripples in these white bathroom tiles used on one wall add a wave-like look to the wall but are close enough to the style of the flat tiles to make the combination work. 2. These slightly concave circular tiles have just enough curve to them to keep them from looking flat, and are a nice contrast to the concrete and wood used throughout the rest of the bathroom. See more photos of this house, here. Designed by Jesse Bennett. Interior design by Anne-Marie Campagnolo. Photography by Sean Fennessy. 3. The uniquely arranged tiles behind this bathtub create a wall full of texture and shape. 4. These tiles have different patterns imprinted on their uneven surfaces to create texture in two ways, and add a sophisticated contrast between black and white to the space. 5. 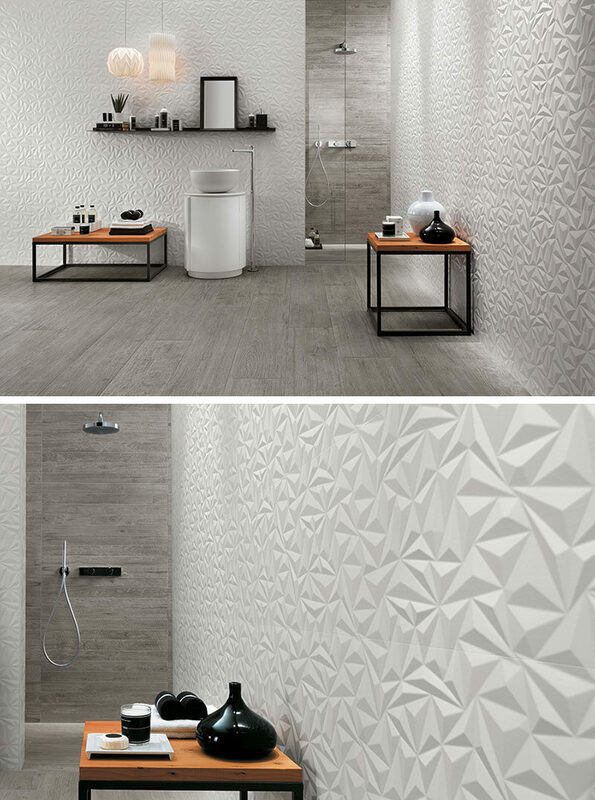 The geometric shapes in these 3D wall tiles create a modern and energizing feel in the bathroom, while the white color and the use of other natural materials makes the space calming and relaxing. 6. 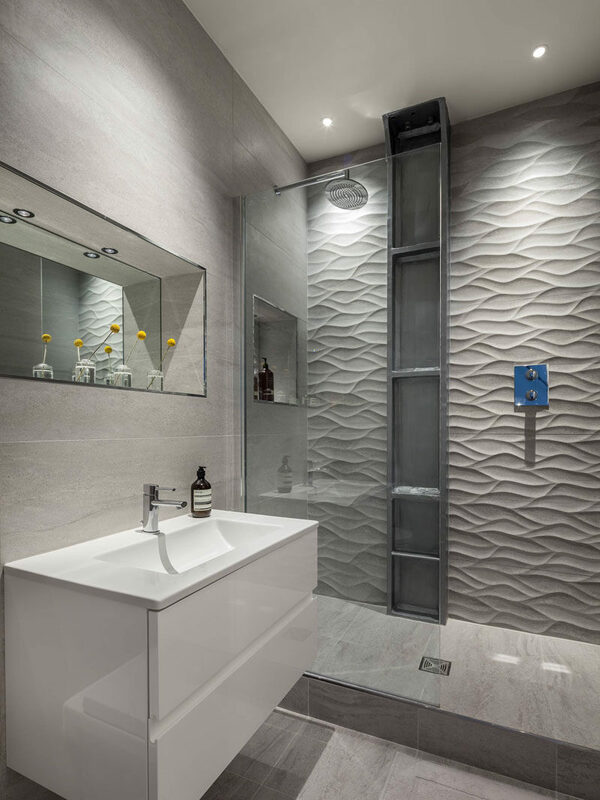 The wavy pattern of these shower tiles give the bathroom a serene feel and resembles the look of a rippling river or stream. Interior design by Michelle Chaplin Interiors. Photography by Simon Maxwell. 7. 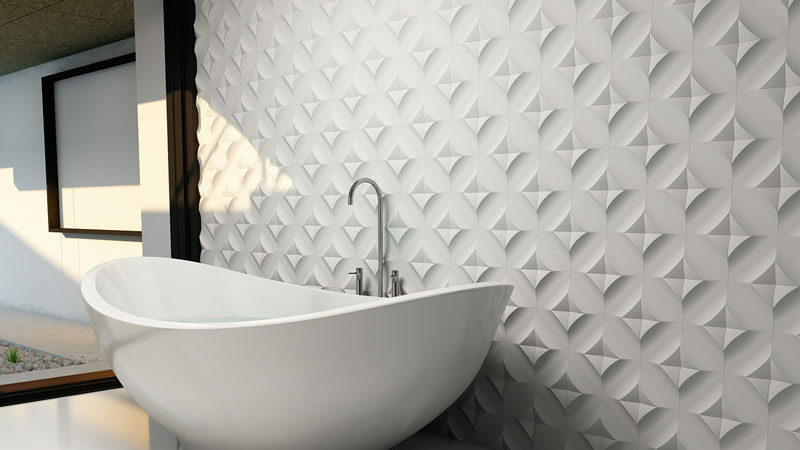 Hexagonal tiles with a bit of texture added to them and arranged on only parts of the walls lets you add depth to your walls in a stylish way that doesn’t feel overwhelming. 8. 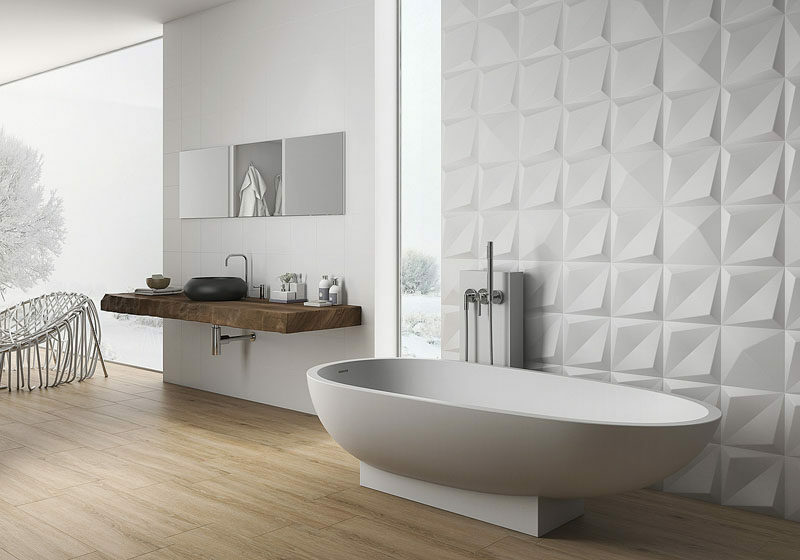 Large 3-dimensional tiles on the wall just behind the bathtub add just the right amount of texture to the bathroom and give it a luxurious feel. 9. 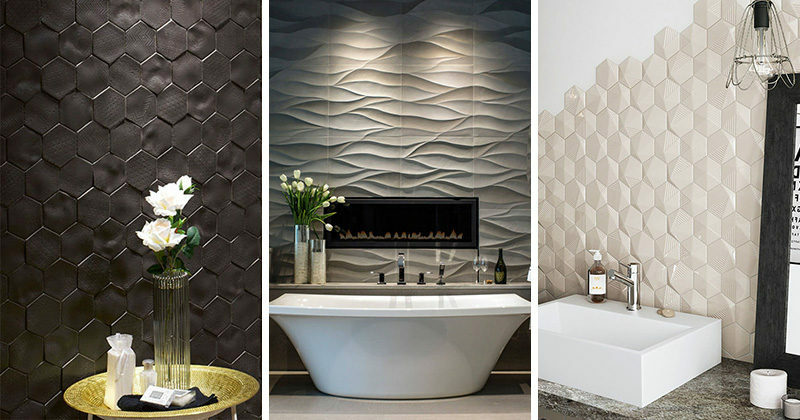 The metallic tiles on one of these bathroom walls give the bathroom a glamorous feel while the white 3D tiles add a more subtle texture to the walls. 10. 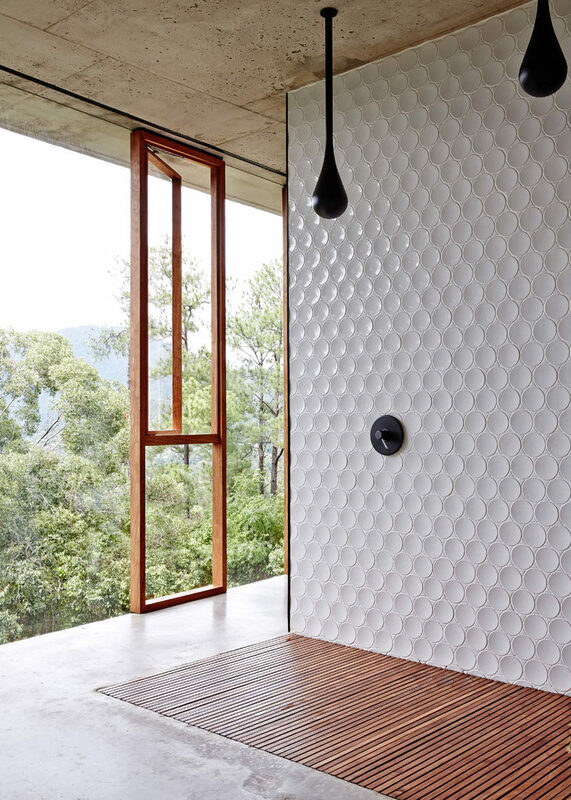 Bubbly looking glass tiles on the one wall of this bathroom give the room a playful look and add a texture to the space you don’t often find in bathrooms. Inspiration from a contemporary home designed by Hennebery Eddy Architects. Photography by Josh Partee. 11. The slightly curved tiles on the walls of this bathroom have been arranged so that you can clearly see their unique shape that gives the bathroom a textured look. 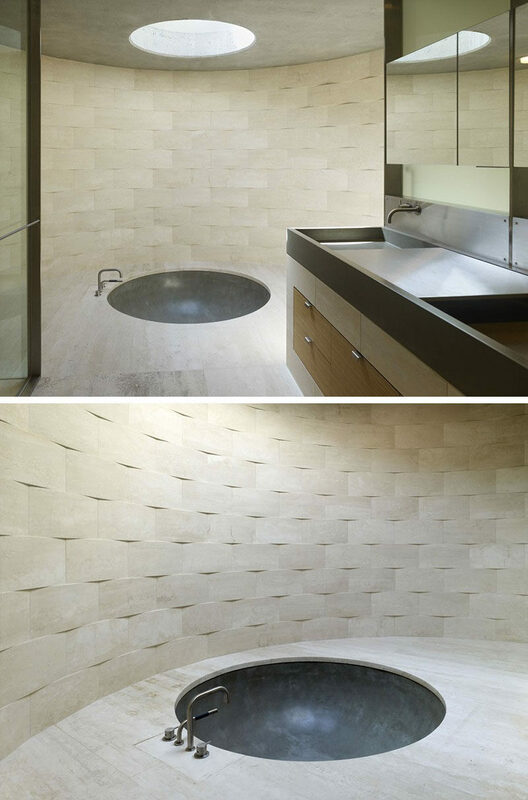 Inspiration from a bathroom with a sunken bathtub designed by Ogrydziak Prillinger Architects. Photography by Tim Griffith. 12. 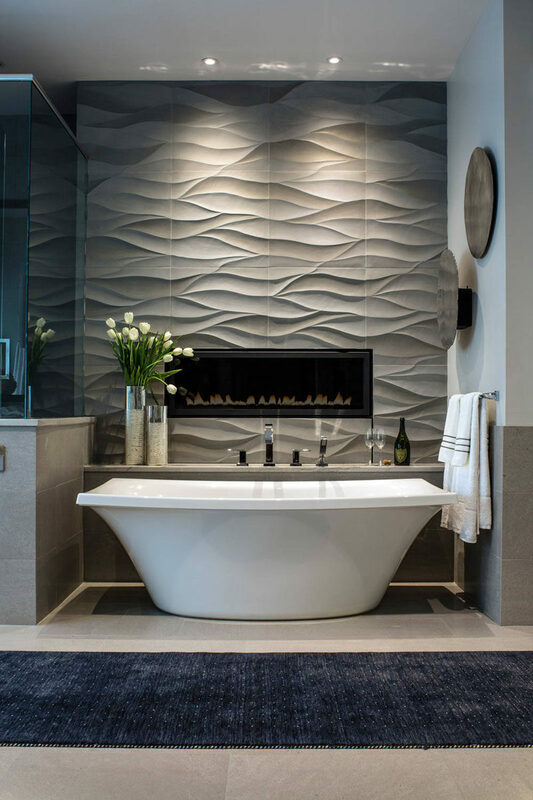 Wavy tiles behind the bathtub and surrounding the built in fireplace create a feature wall that can also double as art. 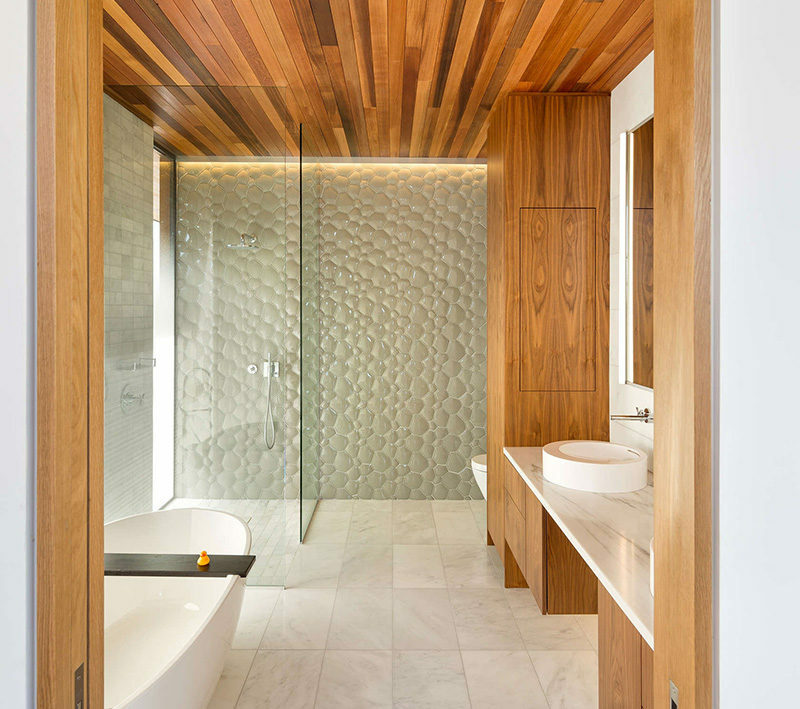 Inspiration from a bathroom designed by Allard & Roberts Interior Design. Tiles from Artistic Tile. Photography by David Dietrich Photography. 13. 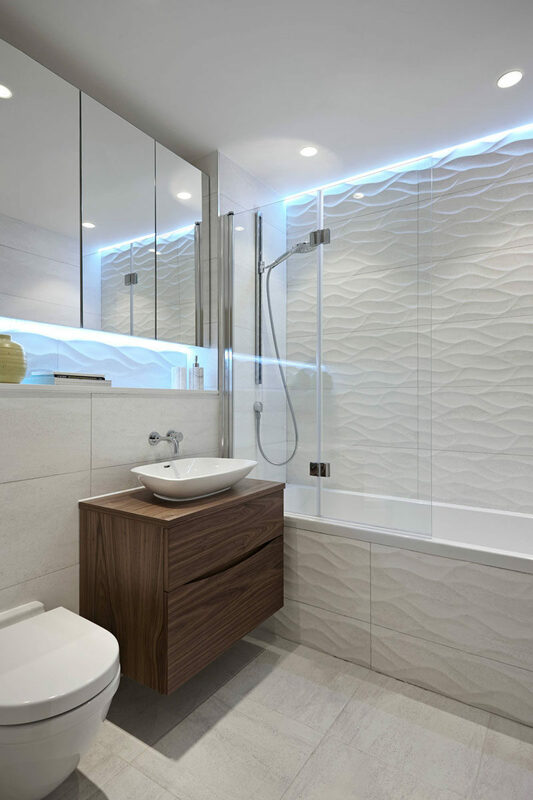 The cool lights above the wavy tiles make this bathroom look like it’s living under water. Inspiration from a bathroom designed by Boscolo Interior Design. Photography by Christina Bull Photography. 14. Dark 3D tiles like these seem less harsh with the natural light hitting them and being reflected from different angles. 15. 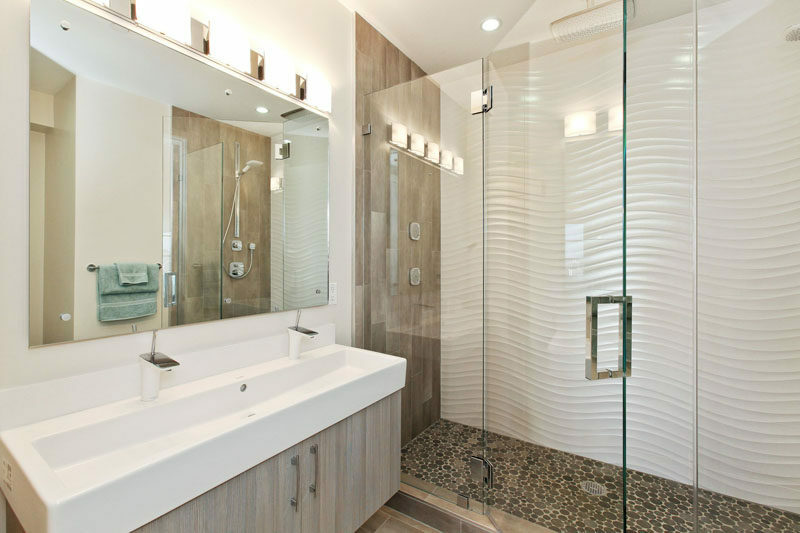 These wavy tiles along with the pebble like shower floor and the wood details give this bathroom a modern beachy look. Tile installation by O’Reilly Tile Design. 16. 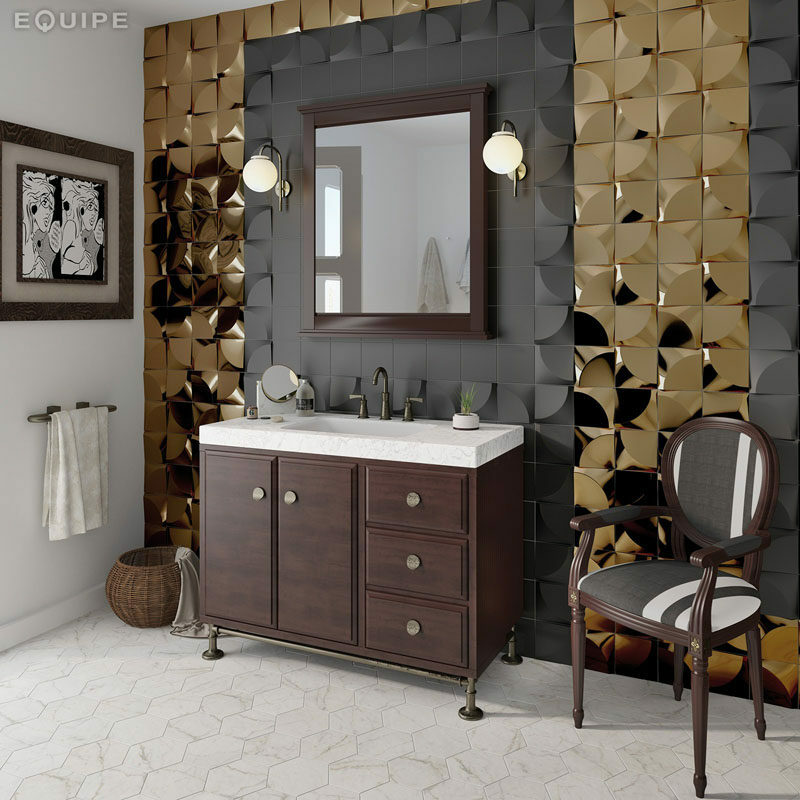 The contrast of matte black and shiny gold 3D tiles around the vanity of this bathroom creates a sophisticated look that’s both masculine and feminine.